This final 2011 Kirin Cup match saw Japan defeat the Czech Republic to retain the UFWC title. Remarkably, all three Kirin Cup matches have ended 0-0, with none of the three participants managing to score a goal or win a match, meaning that the trophy is shared in somewhat embarrassing circumstances between Japan, the Czech Republic and Peru. 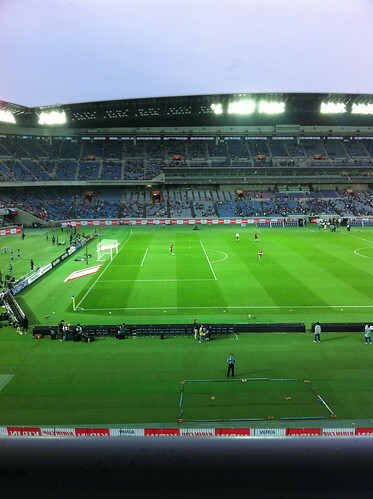 Granted the 2011 Kirin Cup only featured three teams and three matches, but it seems unlikely that any other tournament in international football history has offered so little entertainment. Few Japanese fans would argue against the opinion that the Unofficial Football World Champions were poor in both of their matches, and can consider themselves lucky to still be in possession of the UFWC title. Peru looked to be the best team in the Kirin Cup tournament, and, on the evidence of today’s match, the Czech Republic were the worst. In a fairly even match, Japan had the handful of better chances, and could have won if not for a very good performance by Czech Republic and Chelsea goalkeeper Petr Cech. Makoto Hasebe shot just past the post for Japan, and Yasuhito Endo’s curling free kick was tipped over the bar by Cech as half-time approached. In the second half, Maya Yoshida headed over from inside the six-yard box, and then Cech pulled off a brilliant double save, first beating out Shinji Okazaki’s close-range header, and then clawing away Tadanari Lee’s follow-up volley. For the Czech Republic, Michal Kadlec and Tomas Sivok both had half-chances but failed to find the net. So what’s the next challenge for Japan? A friendly match against South Korea on 10 August should be a tougher test for the UFWC champs, although the Koreans are only one place above the woeful Czechs in the FIFA rankings, with South Korea placed 31st against Japan’s 14th. But Japan vs South Korea is always a massive game – the last time they met was the epic Asian Cup semi final in January that was 1-1 at full-time, 2-2 after extra-time, and 3-0 to Japan on penalties. South Korea have only ever won one UFWC title match, but with Japan having failed to win since January and having stumbled on as champions via draws, anything could happen. I suppose you don’t enjoy AWCQ as well. That being said, I guess Czech and most of Japanese players were thinking of the vacation during the match, while Peru had Copa. The reason why some of Japanese players were so bad would be pretty much because they were simply exhausted (I’m really glad now the season is over). Zaccheroni also spent the almost entire matches in testing a new system. The season isn’t over yet, J.League just started, pro Europe, well done. By the way, the Sapporo dome is a place where the game of England vs Argentina was held in 2002.